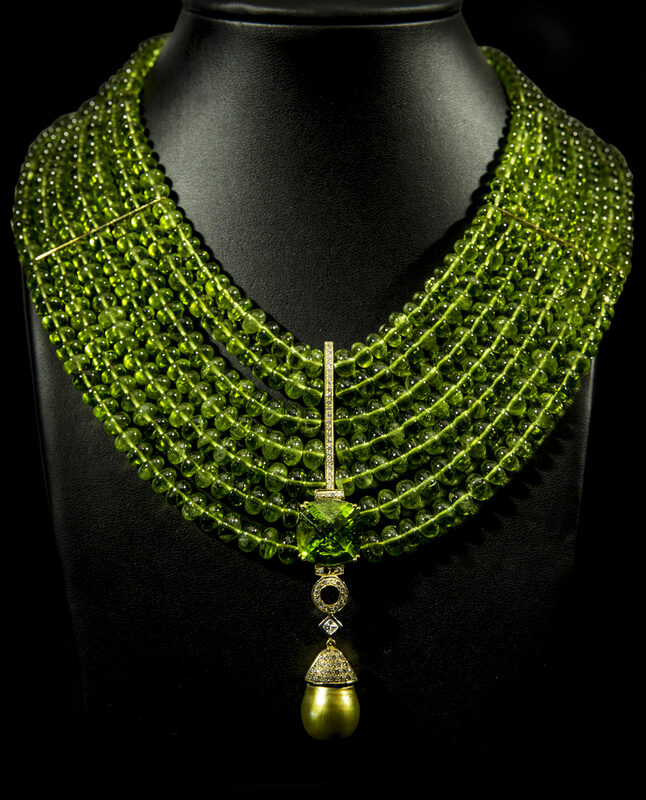 This seven strand, peridot and diamond necklace incorporates top quality peridot beads supported by 18 carat gold spacer bars. In the central ‘grain set’ gold bar is a square cushion cut peridot, which is secured by shortened ‘grain set’ gold bars. Underneath is a grain set gold ring from which hangs a princess cut diamond, supporting a natural pistachio Tahitian pearl drop with a gold pavé set pearl cap. The necklace is knotted onto a gold clasp. This necklace is based on the history of the priestesses in ancient Egypt (such as Cleopatra) whose necklaces had religious implications. Cleopatra wore beautiful peridots and emeralds – so ‘alive’ at night that it was (in the ancient world they were called ‘Evening Emerald’). CUSTOM MADE TO ORDER. Price will vary depending on the price of the stones. Lady Marina is of royal Russian blood (as her family was in Italy during the Russian Revolution). She supports herself as a Dive Operator (based in Portofino, Italy) but will take her prestigious clients around the world, according to their wishes. She has to work as the family lost their inheritance back in Russia. Marina was born in Italy – and loves her business. The closest dive spot to home is Portofino Marine Park with underwater caverns, Margherita de Mare Cave Reef, Albenga where divers can see the wreck of an ancient Roman ship, a great variety of underwater sites, that reveal military vessels, submarines, destroyers and submerged volcanos (such as Ferdinandea Volcano off the Sicilian coastline), brilliant corals, sea creatures and the fascinating sunken city of Baia (the Parco Sommerso di Baia) an underwater city, (near Naples) in which extraordinary sites revel intact mosaic floors, columns, sculptures and villas that once belonged to Emperors. A unique story inspired a unique piece. The remainder of the story will be included with the piece.